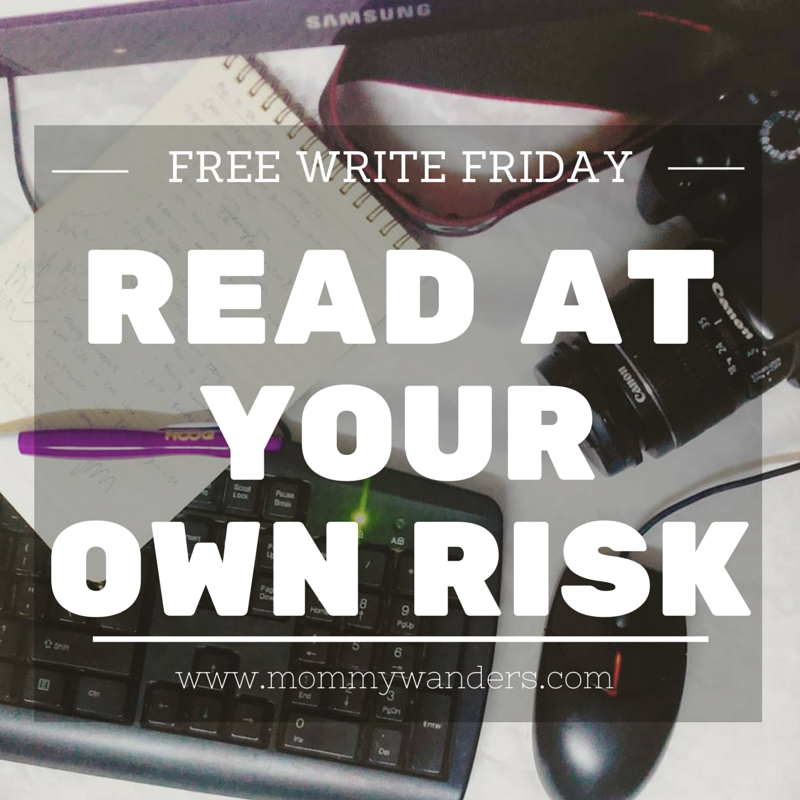 Today I’m gonna start a blog series called Free Write Friday Blogs (FWFB). This isn’t a new thing as I’ve been free writing a lot before and even now. But now, I want to make it a sort of regular thing. I was inspired to do this when I read last night’s Daily Post: The Scariest Post I Ever Published. The Daily Post wasn’t really about Free Writing nor making it a regular thing, but it somehow encouraged me to be bold in blogging. I love the idea of writing something that might be scary to share to the public, but for the sake that it could help at least ONE person get through something, then why not post it. Worth it, right? 🙂 I hope so. FWFB topics could range from my kids to my job to this random stranger guy, to the weather or to my favorite blog or book or dessert or music, or maybe a rant or song or poem, or about the latest news or not so talked about stories, or my dreams or wishes or frustrations. ANYTHING GOES. No holds barred. Don’t get me wrong, FWFB will not aim on the bad stuff. Sh!t happens but I don’t like to dwell on nor share negative vibes here (or anywhere!). I just want to express my true feelings on some matters and hopefully connect with people who understand or relate to the issue/subject. It’s not all rant, or heartaches, know that I will also talk about things that bring me genuine happiness, no matter how small or silly that thing is. I don’t know if they will all be sensible, inspirational, helpful, or even worthy of everybody’s time or what, but I’m sure they are my TRUE experiences and feelings and that some people may feel the same way. Not the best posts, but might be my favorite, so I will publish them anyway. So what do you think of Free Writing, guys? Would you dare to blog spontaneously without having a care in the technicalities and with the possibility of poor judgment? What was the scariest post you’ve ever published? The scariest posts? Maybe not really scary but some of the boldest posts so far were my post about why I'm still on Blogger, my post about the advertisement that came up from my previous employer, Chito-Neri scandal, and Megan Young's basher! Hahaha! O diba showbiz lang? I have a category on my blog called thought bubbles and that's what I usually use when I'm sharing something a little personal or I just want to share randomness. Don't be afraid to speak out your mind on your blog – as long as you're not stepping on someone else's rights. My blog now is too young to have super brave posts, but the post that garnered the most "hatred" in my old blog is the one about our decision to teach our child to speak Filipino first rather than English first. Nice idea! Can't wait to read your FWF post. 🙂 I don't think I have a scariest post yet. My main blog is mostly about DIY and craft projects but I have this other blog where I write about everything else, haha. I just feel like making another one for my rants and such. I have a post on my goal to be brave in blogging. I wanted to be more open about my advocacies and being humble to share my weaknesses in the various life roles I play ( mommy, daughter wife, etc). I'm still working on being a brave blogger. Writing what's in your mind and heart takes a lot of courage and I admire you for being bold enough to pursue this blogging path. Thanks for sharing. True, basta avoid lang anything misconduct. Wow I'm surprised. At home, we speak Bisaya and I don't think people have a problem with that. Hmmm. Great idea! At least, totally focused yung main blog sa crafts lang. 🙂 Thanks for sharing! I don't have specific schedule or topic on my blog. I just write whatever comes to mind.